Deck building is done in the Rune Manager. 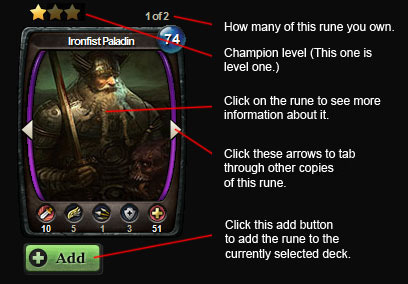 The Rune Manager is a collection of all the runes and decks (excluding Public Decks) that the player has on his or her account. There are four types - Champions, Relics, Spells and Equipment. Each type represents a different creature, item, or effect that can be used to turn the tide of battle in your favor. Relic runes are units that can’t move and can be deployed from a deployment zone or in a space next to a champion rune. They can do damage, strengthen other units, weaken your foes, or other special effects. Spell runes can enhance or weaken champions, deal damage, or apply temporary rules to the game. An Equipment rune is an item like a weapon or artifact that can strengthen or weaken a Champion. These are equipped only by Champion units. To make a playable deck you need 30 runes. The 30 runes either need to be from one faction (full faction) or be a 15/15 split between two factions (split faction). Usually you want more champions than spells, relics and equipment. To add a rune, use the arrows to tab to the rune you want to add to the selected deck (if you have more than one) and hit the add button. There are three ways to get runes. Marketplace: In the marketplace, you can buy rune packs and boxes. These can be bought with either in game currency (gold) or with real money (credits). You can earn gold in the game by doing the daily quests and playing campaigns and pvp matches. Purchasing credits buys you the products immediately. Trader: Other players put runes up for trade here. You can see if anyone has runes you can trade your extras for. Rune Forge: When you have extra runes you don’t want, you can also “shard” them for Nora Shards. This destroys the rune but gives you an amount of Nora Shards. These can then be saved up and spent to acquire any rune in the game (minus the runes from the current expansion and Limited Edition runes). If you are new to the game, you might want to purchase a Pre-Configured Theme Deck viewable on the Decks page. These are specialized decks from each faction, which give you runes that you can also use in your own decks. To learn more about the factions check out the Faction Overview page.